Booking train tickets has become very easy ever since IRCTC website has been introduced. Simply Register on IRCTC website by providing your Email and password. 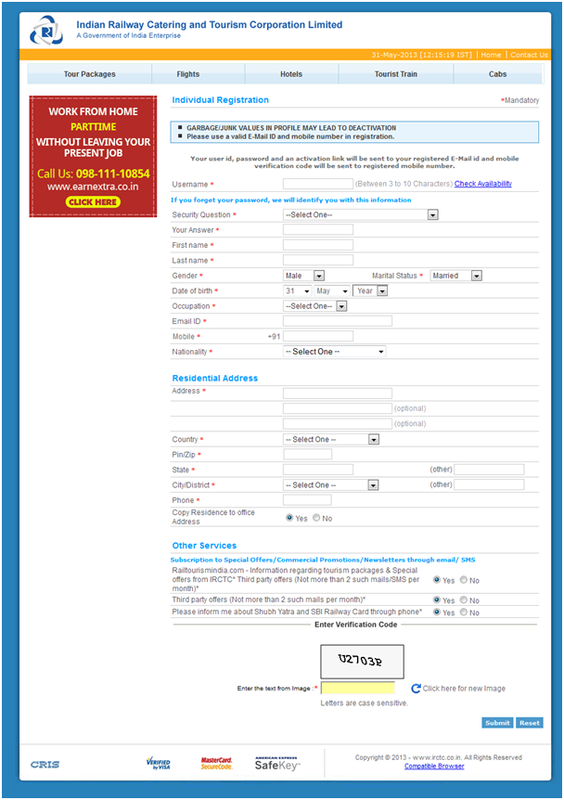 Login to your IRCTC website by simply providing your Email ID and password. IRCTC Login brings you the ease in checking out Train Schedules, Seat/Berth Availablity and PNR status without annoying popups. India occupies 2.2% of the total land on earth. You might be tempted to think that it must possess around 2.2% of the total population on earth too. If you do so, you are making a mistake. India’s population, as compared to the total earth’s population, is not 2.2%, not 3%, and not even 10%. It is a whopping 17.07%! This means that the population here is overcrowded by 7.75 times. In other words, India is overcrowded by 775%! Therefore there is no wonder why traffic jams, scarcity of houses, and madding crowds in public transports are an everyday business. Add to this the negligence of government authorities, travelling to a new city by train can be a horrible experience. In this article we will take a look at the current situation of Indian Railways’ ticketing services. Our main focus would be the online ticketing facilities provided by Indian Railways and to what extent do they help the travellers. Date of inception and intended tasks - IRCTC or Indian Railways Catering and Tourism Corporation was incorporated on 27th September, 1999 but it was not until 3rd of August, 2002 that the operations began completely. It was established to carry out catering, tourism, and online ticketing operations of railways. Some new policies were introduced in 2010 according to which the then Railway Minister Mamata Banerjee transferred the catering services offered by IRCTC to Indian Railways. Even after this transfer IRCTC remains responsible for catering services in some trains like All Duranto Express, Frakkha Express, Maitree Express Train between India and Bangladesh, Kandhari Express and some Rajdhani Express trains. Also, the catering services offered by IRCTC are not limited to railways alone. Below is a photograph of the inauguration of the air-conditioned cafeteria in Lucknow’s Sanjay Gandhi Postgraduate Institute of Medical Sciences, taken from IRCTC’s Facebook page. Statistics and usage- On its first day, IRCTC managed to book only 27 tickets. Today it has 2.5 crore registered members and it generates 35% of the total revenue for Indian Railways. Some reports suggest that currently IRCTC holds 58 servers and recently added 10 more so the total number is 68 servers. Out of the hundreds of thousands of people who log in every day only 1,500 to 2,000 people manage to get tickets per minute. On March 1, 2013 IRCTC was reported to have broken its own record of booking largest number of tickets per day. IRCTC had the record of booking 4.96 lakh tickets on July 7, 2012. But on March 1, 2013 the website was used to book 5.02 lakh tickets, according to a report in The Indian Express. The report went on to say that the system is being upgraded with more powerful Hexa Core servers (with 64GB RAM) from the earlier Dual Core servers (with 8GB RAM), which is costing nearly Rs. 4 crore. With this investment/upgradation, the railway officials are hoping to achieve around 40-45 per cent increase in the booking during the tatkal hours. At present, the IRCTC website books around 48 per cent of the total reserved tickets on the Indian Railways network. There is no doubt that the IRCTC’s website provides great value to the passengers but that does not imply that it is free from its defects. Poor website design - First of all, as you can see from the screenshot above, the design is poor and cluttered and looks unprofessional. It has three ads running on its home page, all clustered around here and there. And these are banner ads not text ads. Text ads usually occupy lesser space but banner ads are annoying. In few cases the ads may help by supplementing the website’s information and pointing people to more useful resources but as you can see, the third lower right ad is about a UPS which has nothing to do with train tickets. As you can see the form is very long and cluttered and might even confuse the less tech-savvy people. There is no Help and Support page or FAQs section to where you can look up for help in case you don’t understand something. In fact there is not even any official online forum where people could discuss their grievances and help each other. Even after you have registered on the site you will encounter slow browsing speeds and sometimes the site can even go down due to heavy load. Thanks for the nice blog and get information of check seat availability train before traveling. It is important for long journey. I want my ticket cancel. Login page not open, pnr number is 6417054552. Otherwise I losses my amount.